In every age, there is the temptation to doubt the Mysteries of the Church—to question how it is that the faithful should remain secure in believing that Christ makes Himself truly present in Body and Blood at the Holy Table. 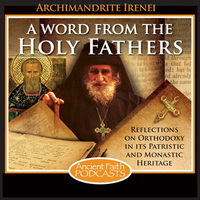 In this week’s episode, Archimandrite Irenei examines an extended text by Nicholas Cabasilas on the substance of our faith in the Mystical Supper. A Word from the Holy Fathers: Do You Truly Believe in the Resurrection of Christ? 1 Peter 1:1-2, 10-12, 2:6-10; Mark 12:1-12.